A Maiden Auction Stakes over 5f 42y on good to firm going. Quite a restricted race type but a few interesting juveniles. Twelve two-year-olds take part, eight with race experience and few pounds from top to bottom weight, especially with newcomer Prancelina taking advantage of Jane Elliot's seven-pound claim. I will detail a few thoughts. This looks quite a tricky affair but a race full of interest. Kody Ridge has run well on all three starts to date and deserves respect. David Dennis' colt has the ability to win a small race and went very close last time out at Lingfield when dropped back to the minimum trip. This son of Kodiac had Rae Guest's Champagne Queen a good few lengths behind. I wouldn't give up on Champagne Queen as this daughter of Showcasing was very well backed for her debut but looked clueless and instantly trailed the field before running on with a glimmer of hope for the future. I imagine connections where bemused if not frustrated by that performance because I expected a bold show. I often use the quote with debutantes: 'the worse they look the better they are' and it could be true of this 19,000G yearling buy. With regard to the contrast principle, it is likely this chestnut filly will be over priced compared with Kody Ridge. They money may come again and if this youngster is backed to 13/2 & less SP I would expect a big run. I would be tempted to have a bet if decent odds are available on the exchange and anticipate a gamble for a no-lose bet. There will be opposition from a few angles. Very interesting to see George Margarson has Jamie Spencer booked to ride Happy Queen. He has only ridden one of the stable's two-year-olds in the last five years. This daughter of Mayson is owned by Jaber Abdulah, who does well with a few cheap buys. She cost 18,000G at the yearling sales. Margarson can win with his debutantes although they are usually his better horses. They can go well when priced 10/1 & less SP and this January foal is likely to be much shorter price than that. Robert Cowell's My Dear Baby was relatively fancied on debut but trailed home a long last behind the talented Mrs. Danvers. She started slowly and outpaced on soft going which may not have been ideal. The red hat would suggest this grey filly is second string of Jaber Abdullah's two representatives [Happy Queen]. 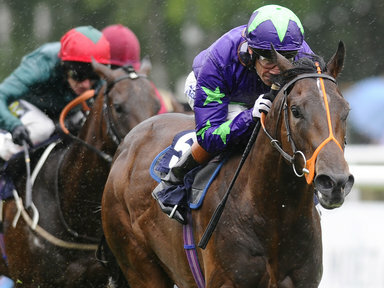 Nile Empress hails from Hugo Palmer's stable. She was made favourite on debut at Brighton over 6f but never looked likely to win after a slow start. This Irish-bred daughter of Holy Roman Emperor is a home-bred but was sent through the sales ring for 20,000G by Hugo Palmer. This is often done with home-bred so they are legible for races of this nature. The betting is key for this filly. If she is priced 13/2 & less SP I would expect this juvenile to hit the frame. If weak in betting, best watched. Eve Johnson Houghton doesn't send many two-year-olds here, which may be a sign of encouragement. Waves did nothing on debut at Bath but showed good pace at Salisbury a race where the form has been franked. The second, fourth and sixth all ran well next start. Not the easiest horse to assess but worthy of respect. Ivor's Magic was fancied to go well on debut at Nottingham over six furlongs on soft going. That wasn't the easiest of races to assess but this daughter of Zebedee is worth noting in the betting. If priced 10/1 & less SP this is another horse who deserves respect and decent each-way claims. If weak in the market, best watched. James Tate is a talented trainer and he has sent a few fair juveniles to race at Yarmouth this season on debut. Lightning North is a daughter of Mayson is out of an unraced mare. She is owned by Saif Ali who is a major patron of Tate's stable and this youngster was purchased by the trainer at the yearling sales for just 10,000G. A stable who can go well at any price with their two-year-old debutantes. If backed it would bring further confidence. Affordability has run three times for Daniel Mark Loughnane but shown ability when runner-up on debut at 40/1, up with the pace if not too keen when stepped up to 6f at Lingfield on soft going, then a respectable effort in a hot Newcastle Stakes race. This bay gelding was a great yearling purchase at just £5,000 and gets in this race on a handy mark, especially with Daniel Muscutt taking off a valuable three pound. It may be worth noting that he beat Kody Ridge on debut and now much better off in the weights. It is fair to say that Kody Ridge had a luckless passage that day but Affordability was exceptionally keen which in my opinion negates that factor. If you fancy the favourite, this horse has to be on your short list if not at the top. William Haggas is a top trainer who does well at this course. Highland Lotus is a bay daughter of Foxwedge out of an unraced Galileo mare. She may be something of an ugly duckling or ran poorly when breezed at two because Haggas bought this April foal for just 6,000G. That price doesn't inspire confidence. The betting is key. If priced 13/2 & less SP has respectable each-way claims but if hated in the betting best watched. Marquee Club & Prancelina are best watched. Conclusion: For a restricted race type - an everyday auction - this is a race where many a trainer will fancy their chance of winning but conversely despairing at the strength of opposition. Looking at horses here as individuals I have a good few which I feel have a fighting chance. The problem is that there are too many with thoughts of winning which tempers my enthusiasm to take a punt. The betting is key for most. The post details these so I will not detail them here, again, as until the betting details the strength and weakness of my analysis we have a pretty long shortlist! Champagne Queen may be worth a bet at big odds as a pre-emptive gamble. If you fancy Kody Ridge I would have a bet on Affordable at 10/1 to hit the frame. Nile Empress and Ivor's Magic are the best stat bets if in their respective betting guide. Until the betting settles we are simply looking at half the story but for a low-grade race, this is a race I am very much looking forward to seeing.